As with a lot of my day trips I had to pass through Washington DC for a work thing and had the afternoon off before heading home so I jumped at the chance to get some new pennies. 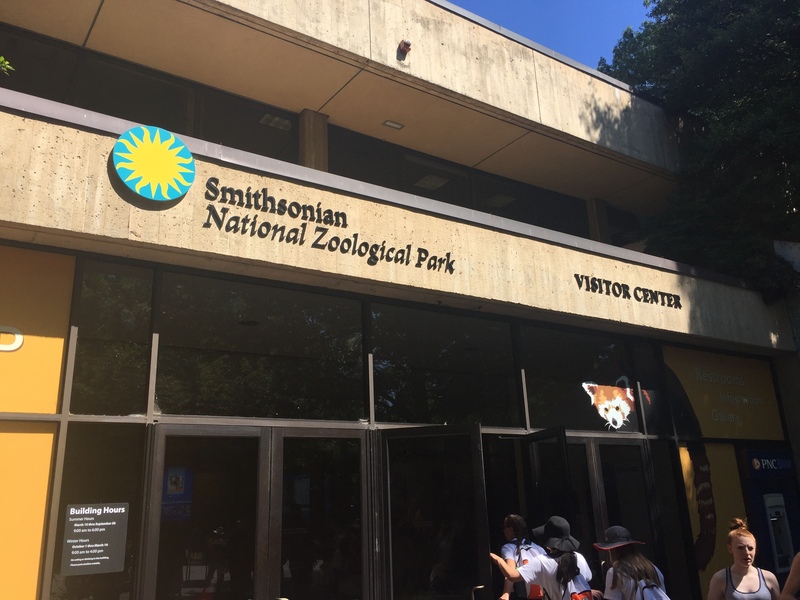 A couple of years ago we took our first daughter Hanna on a long weekend trip to DC and visited all the museums and she especially loved the zoo which you can read about here. 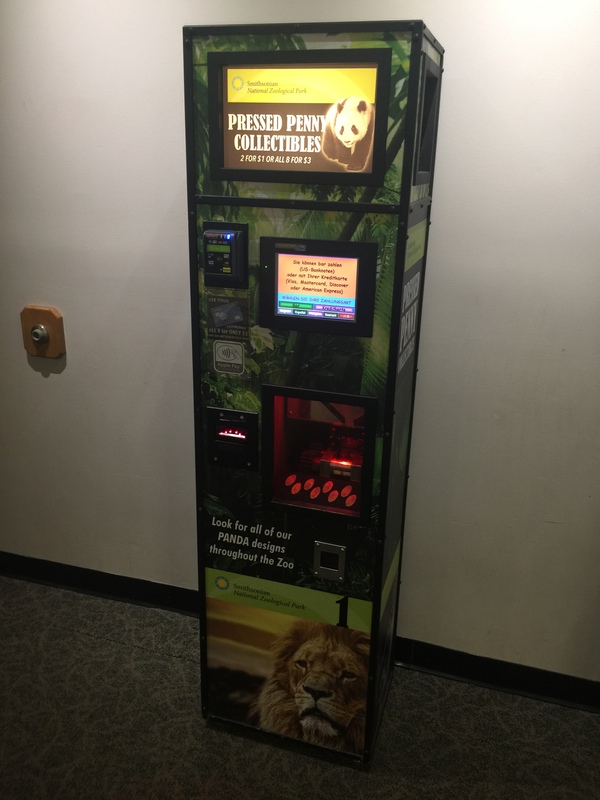 I’m always checking online to see if and when new machines become available to try to keep my collection as up to date as possible, and wouldn’t you know it the zoo had all brand new machines. 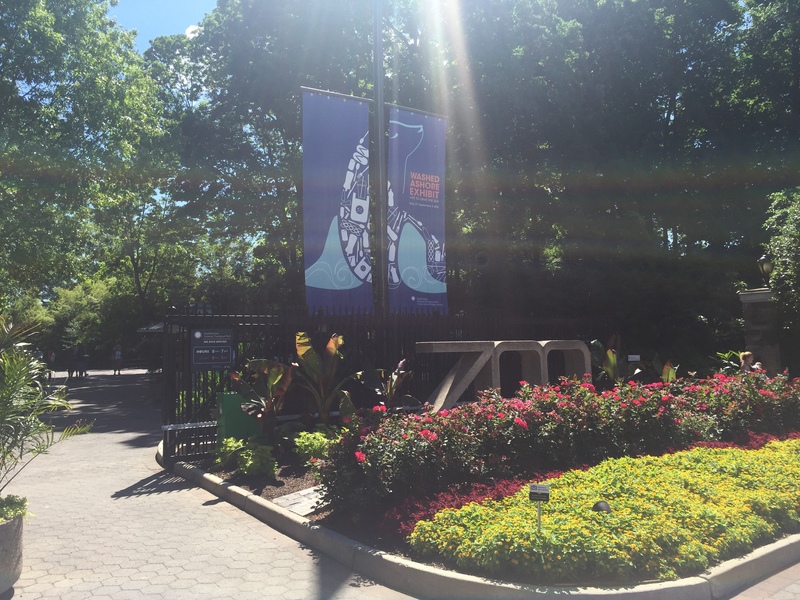 One fantastic thing about the Smithsonian National Zoological Park (whew!) is that it’s absolutely free. There are some places to donate to the zoo and help the animals which I would absolutely recommend everyone do. This place is pretty big and I will give advanced notice part of it is along the side of a fairly steep hill / mountain. I would probably recommend starting at the bottom when you first get there so that once you are heading home you just have to coast down the hill. In any case I did not take my own advice and started at the back near the visitors center which was where I made my first stop. Inside the visitors center is one of the gift shops, a set of restrooms and some other little exhibits to check out. My reason for stopping by is the penny machine located right outside the restrooms. As you can see this is another one of those new fancy super multi mega design machines. This one offers 2 designs for $1 or all 8 for $3. But, it was out-of-order so I came back empty-handed with this one. To help cheer myself up I grabbed an ice cream cone which always helps. 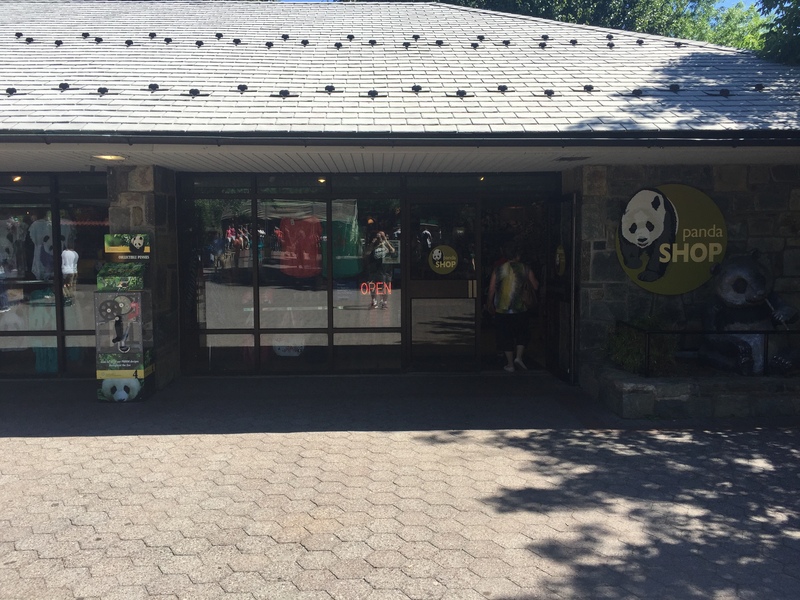 I visited various animal exhibits and next stopped at the Panda Shop. 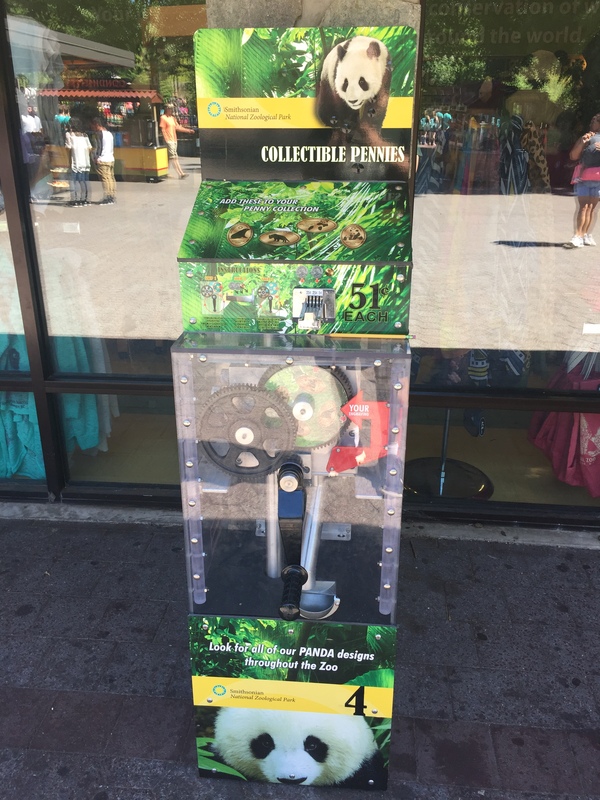 As you can see in the above image the penny machine is located right outside the main door of this store. Another thing I will say about these machines is that they were all decorated really nicely. I’m always a fan of nice cabinet images, the plain ones just never seem as exciting. 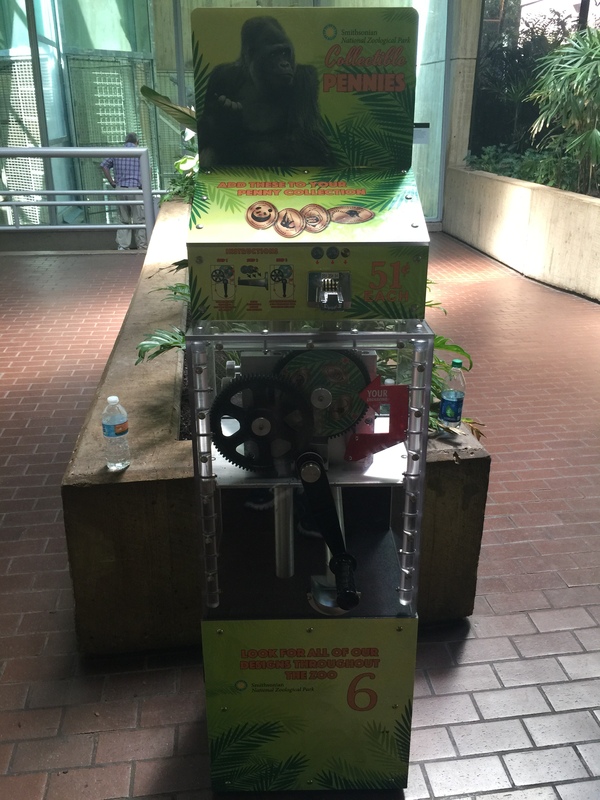 This machine was back to the standard four designs and had images of a Giant Panda with Baby, Giant Panda lying on a rock, a Mountain Lion and a Seal. Nearby was the Bus Stop area which is pretty self-explanatory. 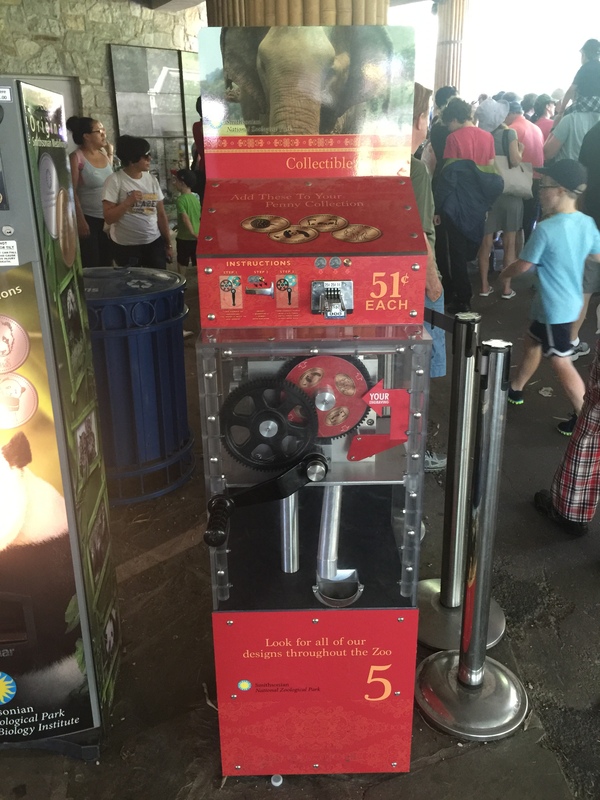 Each of these four design machines are $0.50 plus your penny. 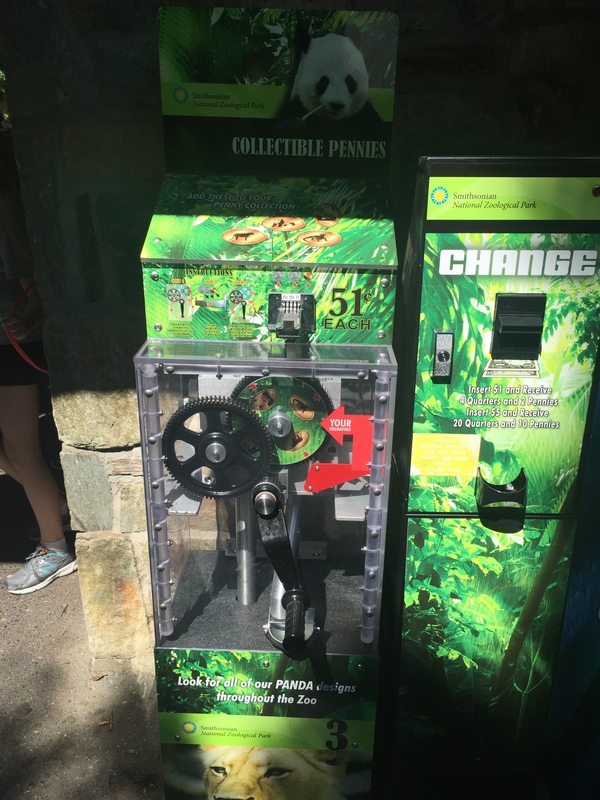 I always come prepared but it was nice to see change machines available. Please note that this Bus Stop is actually where all the school buses and tour buses drop off all their riders. It took me a little while to use this machine because it was just swarmed by school kids from a bout 4 or 5 buses all at once. However the kids were very nice and let me by to use the machine without much fuss. 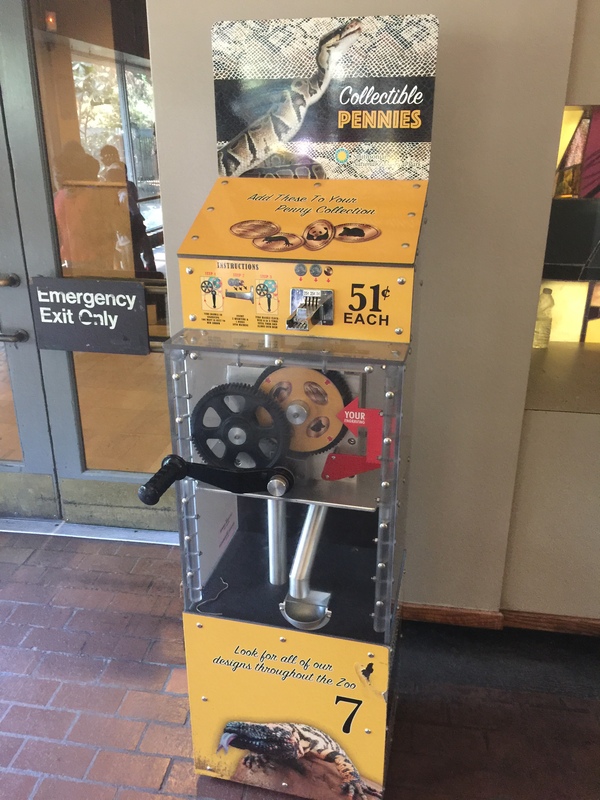 They were interested in watching me use the machine a little too closely (I like my personal space) but after I left I saw them all trying to find loose change for the machine. 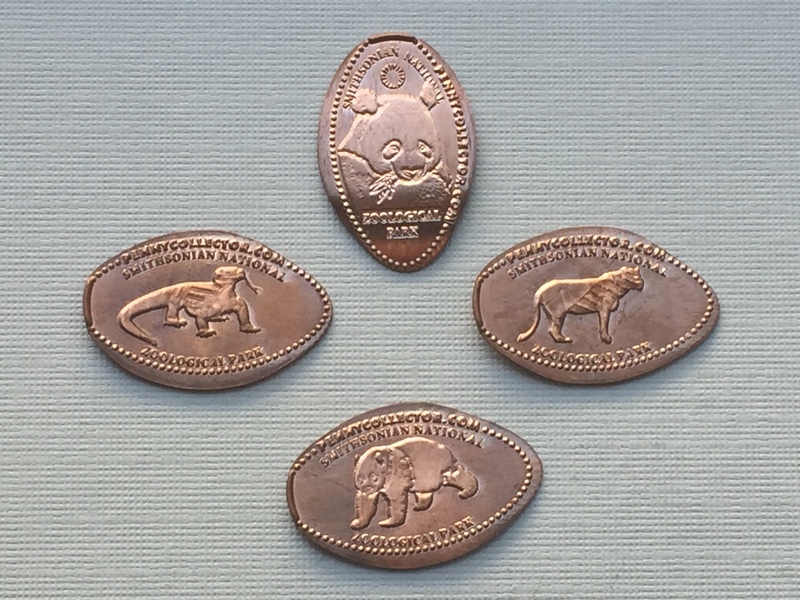 The next four designs were of a Giant Panda eating, a Komodo Dragon, a Mountain Lion, and another Giant Panda walking. Since I was in the Panda area and this zoo is known for their Panda’s that is what I checked out next. Another FYI this area of the zoo is always PACKED with visitors. 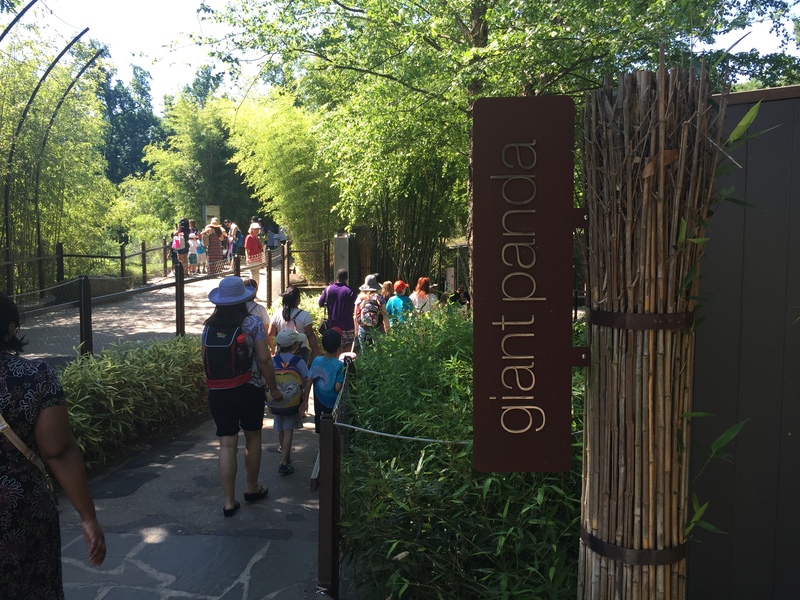 It is not uncommon for the zoo to set up a queue for entering this area so be prepared to wait. This trip however the Panda’s were actually being kept inside. I’m not sure if it was due to the heat or not but this did help keep this area a little calmer. Down near the outside viewing area is nice coverage section with interactive displays and is a pleasant place to take a break from the sun. This was also where the next penny machine. Sick of Pandas yet? How can you possibly be they are so cute and watching them eat bamboo is fascinating to me for some reason. 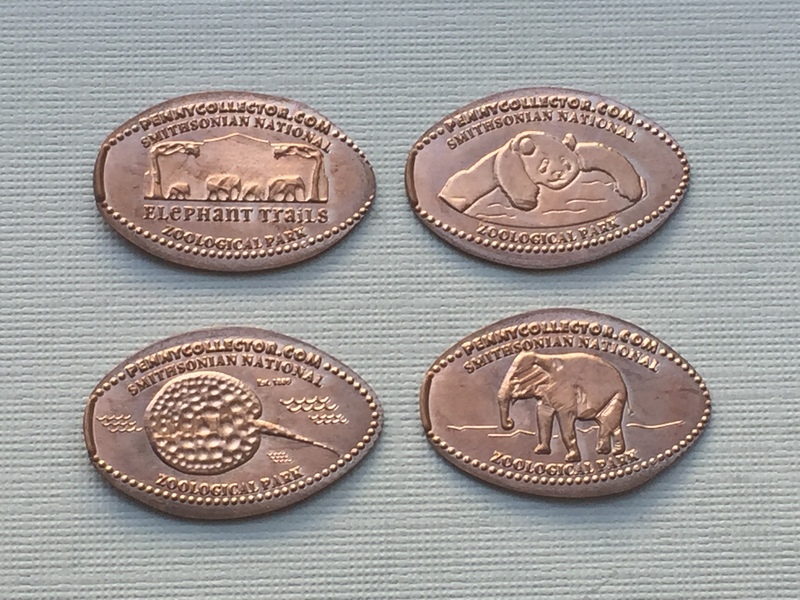 Always, these pennies had the Elephant Trails, a Panda lying on a rock, a Spotted Eagle Ray, and an Elephant. Once inside I finally found one but as you can see from the picture above he was not up to entertaining his guests. Oh well maybe next time. 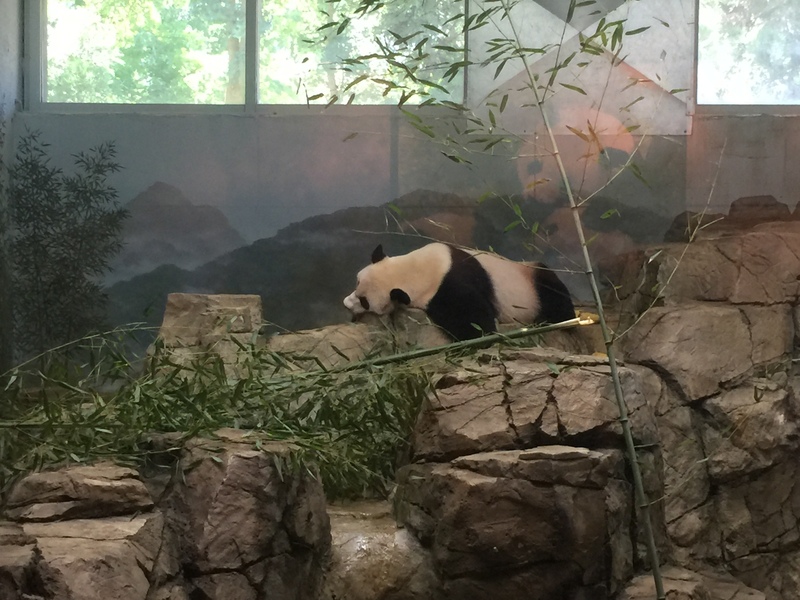 I made good time through the panda exhibit and as I left the crowd was really started to fill up (probably due to all the students, I really miss field trips). Now I was at the top of the mountain and was making my way down trying not to think about the climb back up I would have later on. 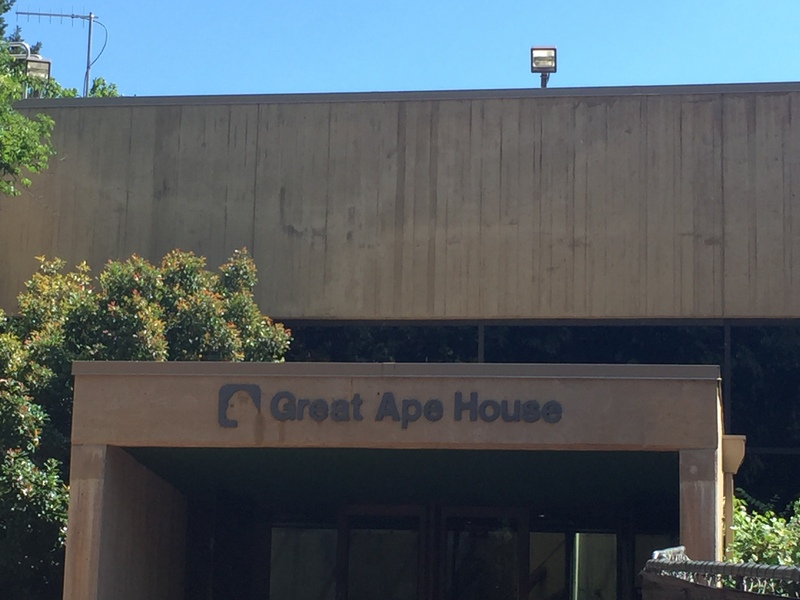 One of the first buildings I came to was the Great Ape House. If you like primates this is the place for you. There are some outside but again due to the heat most were inside. About half way through the Great Ape House I took a break from monkey watching to use the machine located inside. 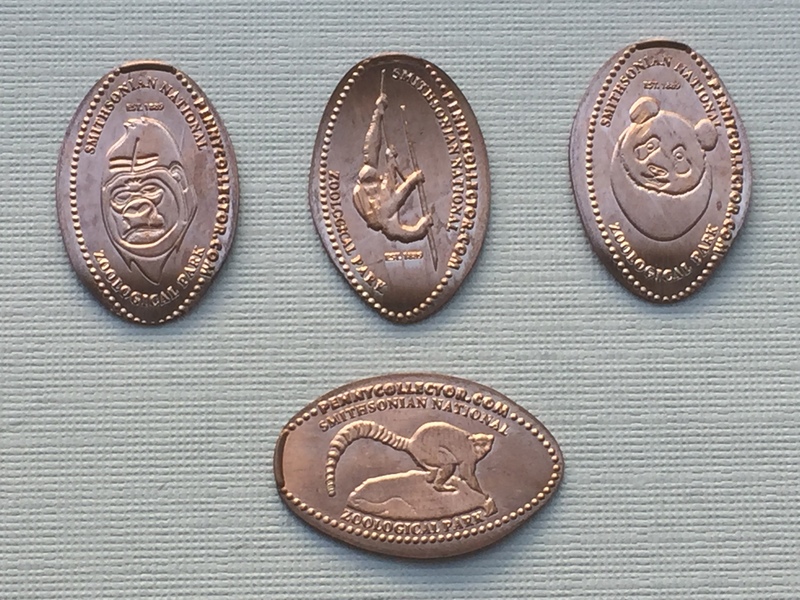 You may have guess that these coins would be themed after the primates and you would be absolutely correct. The designs are as follows a Gorilla’s Face, an Orangutan on a vine, a Panda Face and one of my favorites a Ring-Tail Lemur. 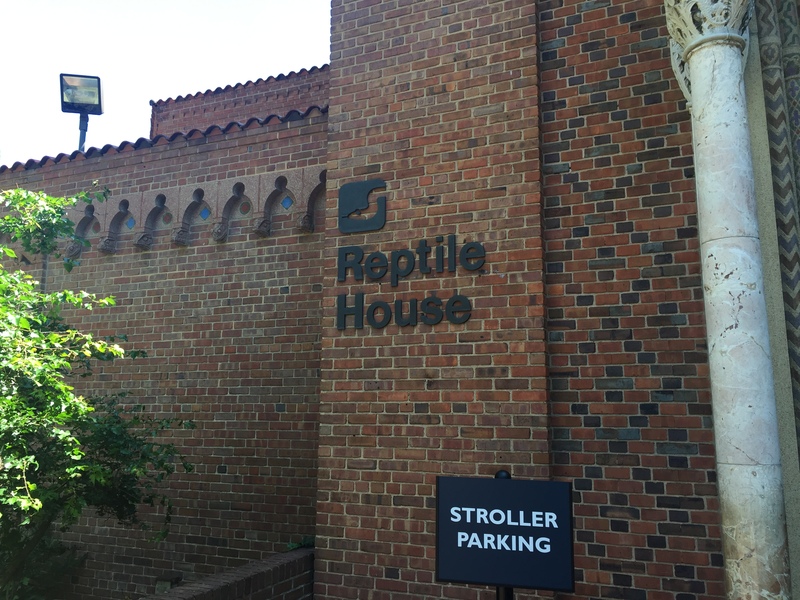 I finished visiting with the monkeys and headed outside only to go immediately into the next building which was the Reptile House. Here’s a little disclaimer I’m not a fan of snakes and Reptile houses are usually filled with them. I do my best to confront my fears but I’m still convinced they will escape from their exhibits. Sucking it up and made a mad dash inside, used the machine and got the heck out of there. Unfortunately due to this I can’t really tell you what other animals are inside, but I will say the machine worked perfectly for the few moments I was there. 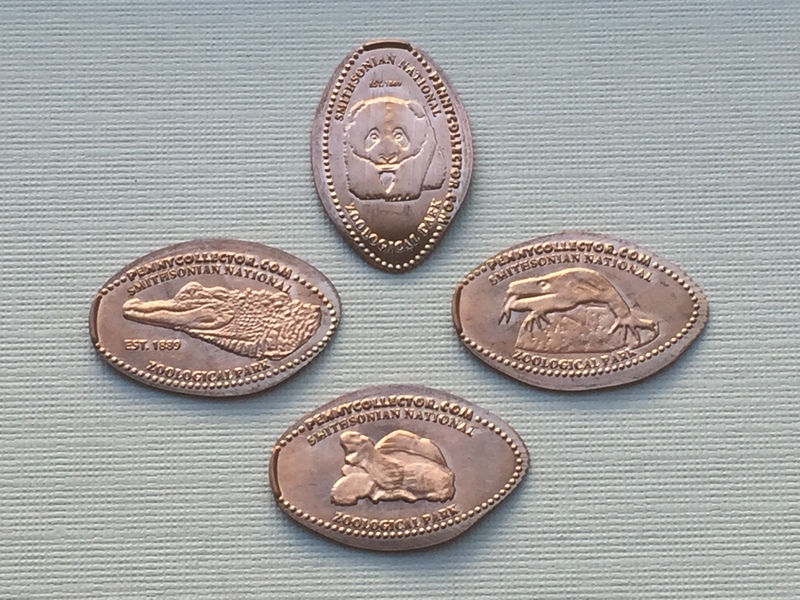 Next four pennies designs were reptile themed except for another panda. The images included the Baby Panda, an Alligator, a Komodo Dragon, and a Turtle (Tortoise?). I finished walking down the mountain and make a quick stop in the Mane Grill (Lion exit was near by get it, haha). After a short snack I found the last penny machine near an Info Booth and a wall of vending machines. 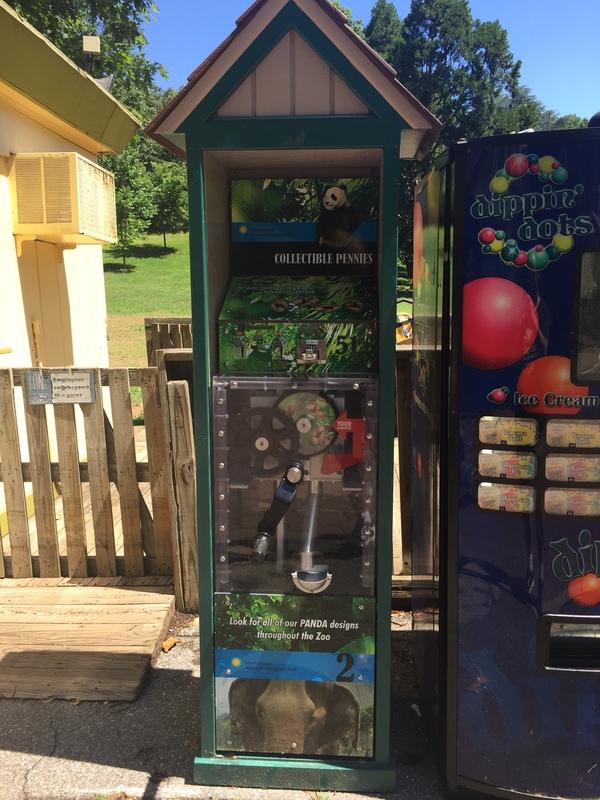 Even though I always had eaten some ice cream the Dippin’ Dots machine beside the penny machine was calling my name so I pressed the coins as quick as I could. 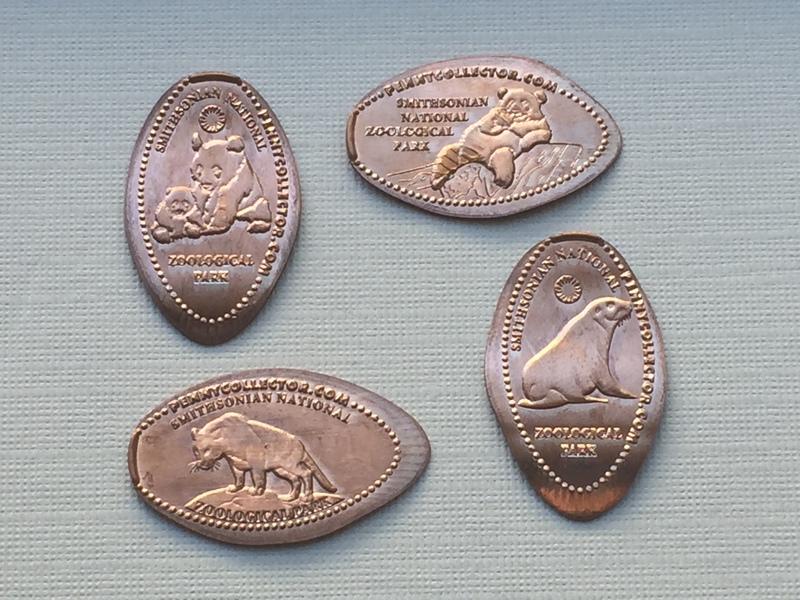 These last four pennies had a Cobra, an Elephant, and Panda lying down, and lastly the famous Panda Bao Bao. With Dippin’ Dots in hand I started my slow climb up the mountain and headed towards the exit where my car was located. 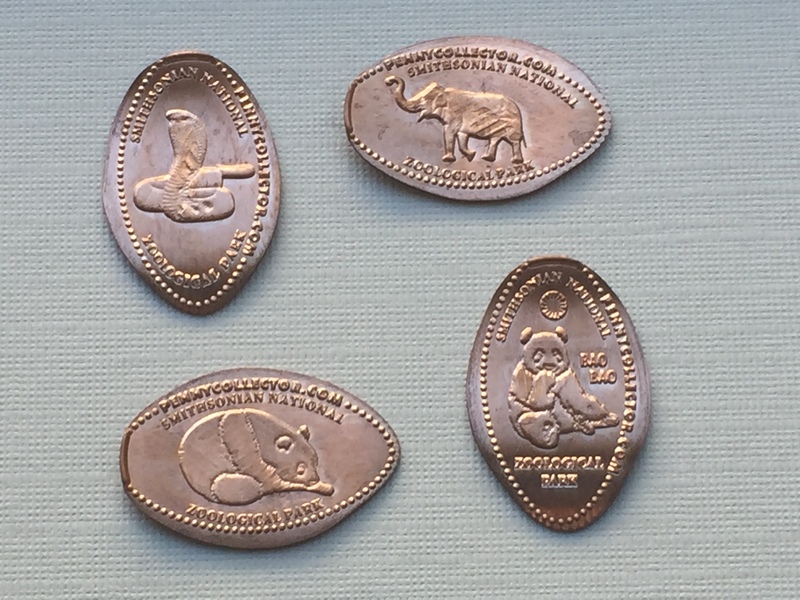 It had been a fun day visiting with the animals, doing some cardio and getting a whole bunch of new pennies. Even though the big fancy 8 design machine was out-of-order I’ll try sending a letter to the zoo in an attempt to get a set. This is a great zoo with some really unique exhibits I haven’t seen anywhere else. Be sure to check it out if you’re in the Nations Capital but don’t forget to bring your walking shoes.